I finished reading this book yesterday. I got it on interlibrary loan. There are only 4 copies according to the WorldCat database in the United States. Sometimes I have what you might call more academic interests than the average person who uses the public library. I realized that the databases that the public library has access to is NOTHING compared to a University library. It seems to me that they should be interconnected, especially if it’s a public university. Anyways, I’m glad I was able to get this book. Ivan Kireyevsky was a layman in Russia who was trained in Western philosophy. He came back to Orthodoxy in his middle age. 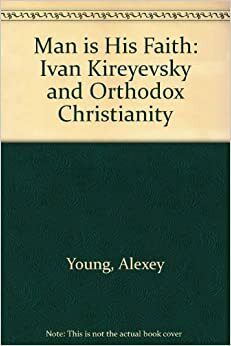 Because western philosophy had infiltrated Russian thought, especially among the intelligentsia and upper eschalons of Russian nobility, he was trying to reveal the truth of Orthodoxy to them and expose the faults of western paradigms. My husband found a reference to this book in Father Seraphim Rose: His Life and Works by Hieromonk Damascene. I’m so glad we were able to read it. I highly recommend it to anyone who can find a copy or get it through interlibrary loan.